“In the six hundredth year of Noah's life, in the second month, the seventeenth day of the month, the same day were all the fountains of the great deep broken up, and the windows of heaven were opened. Throughout the world, geologists and paleontologists find physical anomalies that they cannot explain with the evolutionary theory. Hello, I'm John Gusty, and through a blending of scripture and scientific observation, the Hovind Theory is a fascinating explanation of the Flood, the ice age, the formation of coal, mountain ridges, and the Grand Canyon. Where did the water for the Flood come from? 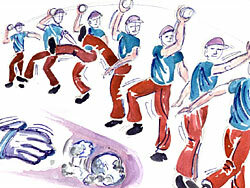 - What about ‘magnetic reversals’? - What froze the mammoths in upright position? 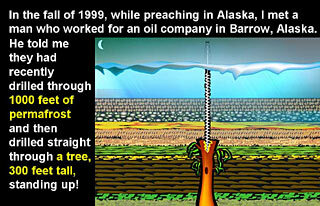 - Trees in Alaska that were 300 feet high? - Were mammoths designed for cold weather? What happened to them? 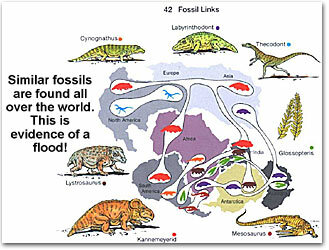 - Clams found at the bottom, birds found on top, does that prove that clams evolved first and birds last? - Where did all the water go? ; If something goes down, something else goes up! - Kangaroos: How did they get to Australia and why are they only there? Well, thank you for joining us; it's an honor to be here at Tennessee Temple University. All three of my kids went to school here. I almost went to school here, was registered and enrolled but ended up going to Mid-Western instead, Mid-Western Baptist College. But it's good to be here in Chattanooga, Tennessee. 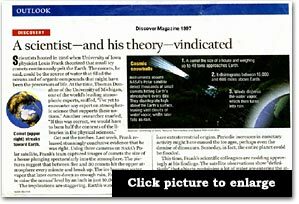 I'm gonna share with you this morning what we call The Hovind Theory. What caused the Flood in the days of Noah? I think Christians better have a good answer to the skeptics and scoffers. If you do any kind of evangelism at all, if you try to win anybody to the Lord, you're gonna run into people who have a big obstacle to overcome called, evolution theory. 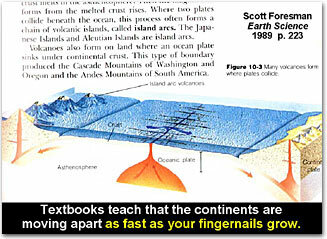 They've all been taught for years and years and years that the earth is billions of years old. It took billions of years to form the different layers of geologic strata. And you're gonna have to overcome all that if you're gonna win them to the Lord. First thing a missionary has to do is learn the language so he can talk to the people he's trying to reach. And I think we as Christians better learn some of the language and be able to reach the people we're trying to reach in this community, and around the world for that matter. 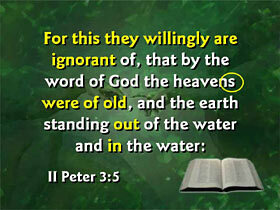 Now, the Bible teaches the earth is about 6,000 years old, not billions of years old. If that's true, then we better explain some things. How did we get these giant canyons on earth like Grand Canyon? 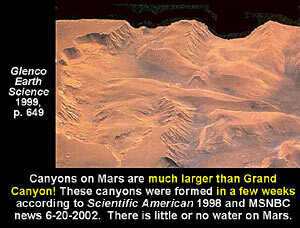 Even the canyons on Mars bigger than the Grand Canyon? How do we explain that? How do we explain the frozen mammoths? The big, huge, hairy, hippy elephants that are frozen standing up, some of them. Where did all the water for the Flood come from? Where did the water go after the Flood was over? These are fair questions that the atheists are asking and we better have an answer for them. Why did Kangaroos end up only in Australia? What did God do before the Creation? I mean, there are thousands of questions that we as Christians are gonna come up against as we deal with the lost, trying to bring them to Christ. It is my prayer that this session, or video #6 of our series, The Hovind Theory, will give you an outline or theory of world history that'll give you the skeleton to hang the meat on. This is just a theory. I'm not particularly attached to any particular theories. If anybody finds something wrong I'll change it, ok. But a lot of people have influenced this and so far, after 16 years of preaching and teaching on this topic, I have not found any serious flaws with the theory. So, if you come up with some, please let me know. The Creation, which we covered earlier on seminar part 2; we'll just touch on that. The Curse, God putting a curse on the ground. And then the Catastrophe, the Flood. What caused the Flood in the days of Noah? We start off with the Creation. The Bible says: “In the beginning God created the heaven and the earth.” (Gen. 1:1) Before the Flood came, the Bible says the people lived to be over 900 years old. Do you realize that you could learn a lot in 900 years? Many people have never even thought of this, but Adam spoke every language in the world. ’Cause there was only one, ok. And he was married to the prettiest girl in the world too, by the way. Things were very different before the Flood came. We cover all that on videotape #2 of our series, so get that seminar 2 if you don't have that one. The Bible says in II Peter, chapter 3: “Knowing this first, there shall come in the last days scoffers.” Did you know there are people who scoff at the Bible? And the reason they scoff, it says is because of “their lust.” They don't want God telling them what to do. That's the bottom line every single time. I've never seen an exception to that after doing over 90 debates in universities and about 7,000 radio and TV call-in talk shows. I'm convinced the only reason people scoff at the Scriptures is because of their lust. There is no scientific reason to reject the Bible and there's no scientific reason to accept evolution. But they just don't like God telling them what to do, bottom line. The scoffers are gonna say: “Where is the promise of his coming? 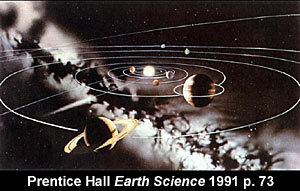 For since the fathers fell asleep, all things continue as they were from the beginning of the creation.” (II Pet. 3:4) This is called the uniformitarian doctrine. “Hey, the way things are happening now is the way they've always been happening, long, slow, gradual processes.” We cover more on that on videotape #4. The Flood, about 4,400 years ago. They don't want to admit that God created the world, because that would mean he owns it and He makes the rules. They don't want to admit that there was a Flood, because that means he has the authority to judge his Creation. And I think we as Christians had better have a good understanding of what that Creation was like and what that Flood did to the world. So that way we can understand how things are today and be better prepared to evangelize this world we are called on to reach. There's a judgment coming soon, folks, to a city near you. Well, the scoffers don't like the Creation idea, they don't like the Flood idea. And they sure don't like the coming judgment idea. But if we can get a good understanding on these three, I think we will be more effective in our evangelism of this world. 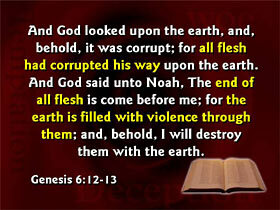 The Bible teaches the world was created about 6,000 years ago and God made a perfect Creation. 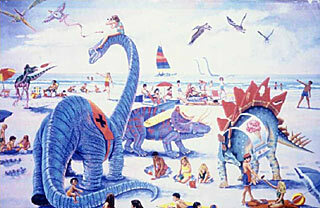 Dinosaurs lived with Adam and Eve; it was a wonderful place. We cover more of that on seminar 2. And then God put a curse on the ground because of their sin. 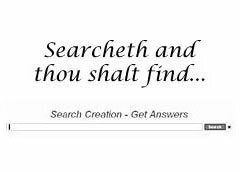 The Lord said: “Adam, where are you?” (Gen. 3:9) He was hiding, of course, because of his sin. 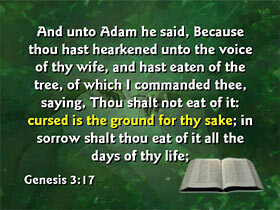 He said: “Have you eaten of the tree that I commanded you should not eat of it?” (Gen. 3:11) Adam's first response. God said: “Adam? Have you eaten of the tree?” Adam says: “The woman..., that you gave me...” (Gen. 3:12) He tries to pass the buck, you know. “Oh God, this is really your fault that I did this, you know. Because if you hadn't given her to me I wouldn't have this problem. And if you hadn't made her in the first place we wouldn't have this problem.” Everybody does that, trying to pass the buck, you know. “Lord, the woman that you made....” In other words, it is her fault and your fault. But finally he confessed and says: “Yes, I ate of the tree.” (Gen. 3:12) And then He says to the woman: “What have you done?” And she says: “The serpent (implying ‘that you made’) tricked me and I ate.” (Gen. 3:13) She finally reluctantly confessed. And then God said to the serpent: “You're gonna be cursed and crawl on your belly all your life.” (Gen. 3:14) He said to the woman: “One of your curses is the man is gonna rule over you.” (Gen. 3:16) It's one of the curses, girls. The husband gets to be the boss, ok. And it is a curse in many cases, ok.
And to the man He said: “I'm gonna curse the ground for your sake.” “Cursed is the ground for thy sake.” (Gen. 3:17) This is a fascinating verse. God said: “Adam, I'm gonna curse the ground for your own good.” It's good that the ground is cursed, because now you have to work for a living. This is gonna keep you busy. You're gonna work all day; you are gonna go home tired. What if God provided everything for everybody all the time, and you never had to work a moment in your life. All we'd do is sit around and think up ways to get in trouble. That's one of the problems of welfare. The Bible says: “God's welfare program is real simple. If you don't work, you don't eat.” That was my welfare program with my kids growing up; if you don't work, you don't eat. Plain and simple. It doesn't take long to get their chores done. In the morning you give ’em a list of things to do. You know, make your bed, do your homework, blablabla... You sit down for supper, you all pray together: “Lord, bless the bunch as they crunch their lunch. Amen.” And you look: “Stop, before anybody eats, let's see. I noticed son your bedroom is not clean; and daughter, your homework is not done; so you guys go finish that and come on back and eat when you're done.” You only got to do that once to get their attention. If you don't work, you don't eat. That's God's welfare program. But in America we got a serious problem, because we pay people to not work. And God said: “Cursed is the ground for thy sake.” Work is one of the best things for you. It's a wonderful therapy. The Lord said: “In the sweat of thy face thou shalt eat bread, and then you're gonna to return to the dust when it's over.” (Gen. 3:18) You're gonna die. Then along came the Flood in the days of Noah. Genesis, chapter 6. This is most what we're gonna focus on today. “God saw the wickedness of man was great in the earth, and the imagination of the thoughts of his heart was only evil continually. And it repented the Lord that he had made man on the earth, and it grieved Him at his heart. And the Lord said, I will destroy man whom I have created from the face of the earth; both man, and beast, and creeping things, ...for it repenteth me that I have made them.” (Gen. 6:5-7) “And the earth was filled with violence.” Everybody was wicked. And God said, That's it! Noah, go build a boat. 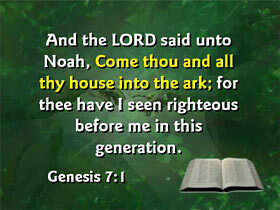 “And God said, Make thee an ark.” (Gen. 6:11-14) And Noah said to his boys: “Hey boys, go for wood. We got to build a boat.” And so they went and got all this wood and they built the big boat. And we cover more on that. People say: “Now, wait a minute, hold it. Why would God make a flood for the whole world? Why not just kill the bad people? Isn't that kind of cruel to destroy the whole world? I mean, after all, the penguins didn't sin.” Well, we know that God destroyed the whole world. I think there are some things to consider about this flood. The Flood left evidence where a miracle would not. If God had just said: “Ok, I want everybody to die, except Noah and his family.” What evidence would be left behind from that? 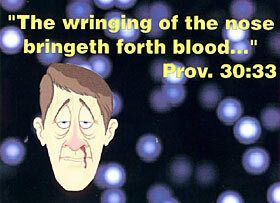 The effects are here today for us to see and remember the judgment of God on sin. Plus, by God telling Noah to build the boat, it gave everybody warning time. Here is Noah out there, probably for who knows how long, some people say 7 years, some people say 120 years. The Bible doesn't say, but Noah is building this ark for a long time. People are watching him put this big boat together and said: “Man, Noah, are you crazy? What are you doing?” He says: “Man, it's gonna rain.” Now keep in mind, it probably...; I don't think you can prove this dogmatically; it probably never rained before the Flood came. So Noah was preaching about something that had never happened. He said: “Hey guys, guess what. Rain is gonna fall out of the sky.” Everybody is looking around saying: “Yeah right, that's never happened.” They thought he was nuts. Hey, we're doing the same thing today as Christians. We're going around saying: “Hey, one of these days an angel is gonna come down with the Lord and they're gonna come through the clouds and blow a trumpet, tututuuuu..., and the Southern Baptists rise first, (you know the dead in Christ go first) and then the rest of us are gonna take off for heaven.” And everybody is looking at us saying: “Yeah right. Nobody has ever heard a trumpet blown from a cloud and saw people take off for the clouds.” I mean, that has just never happened. We are preaching that something is going to happen that has never happened in the history of humanity. That's what Noah was doing. He was preaching something is going to happen and what he's preaching about had never happened. So while he's preaching, this gave people a chance to repent. People say: “Wait a minute. How could the whole world flood? Could it rain enough to cover Mount Everest?” I was in a debate one time and the skeptic stood up and he said: “Hovind, do you realize, when it rains, it releases heat into the atmosphere.” I said: “Yes sir, I taught physics. It's called latency of condensation. What's your question?” He said: “Well, if it rained enough to cover Mount Everest, the heat would cook the entire world.” I said: “You are exactly right.” He said: “But don't you think it rained enough to cover Mount Everest?” I said: “No, I've never said that.” He said: “Well, do you think Mount Everest was covered?” I said: “Well, I don't think Mount Everest was there.” I don't think the mountains even formed till late in the Flood. The Bible covers that in Psalm 104. We'll get into that later when we talk about the mountain ranges forming on this planet. But no, I don't think it rained enough to cover Mount Everest. I don't know any Christians that teach that. I think what happened was, the whole world was covered with water, but the water didn't come from rain. Very little water for the Flood came from rain. So they built up this straw man, if it rained enough to cover Mount Everest it would cook the world. And that's correct, but it's an artificial argument. That's not where the water came from. There are several theories about what caused the Flood in the days of Noah. 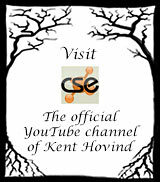 I'm gonna share with you my theory in a few minutes, ‘The Hovind Theory’, of what may have caused it. We call it that because I don't want anybody else to take the blame for it if it is wrong. I will take the blame if it's wrong. And this will not be super evangelistic. It's just a matter of giving you some scientific evidence to put things together in your mind, and say: “Wow, maybe that's what happened.” And give you an answer to some of the skeptics and scoffers and atheists. We need to understand a couple of things. The original Creation was very different. The Bible says, there was not only the earth but that there was water inside the crust of the earth: under the crust of the earth actually. 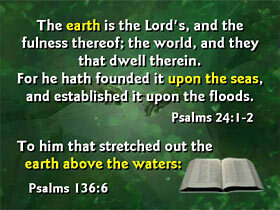 Psalm 24 says: “The earth is the Lord's, he founded it upon the seas.” That's an interesting verse. The earth was built on top of the water. 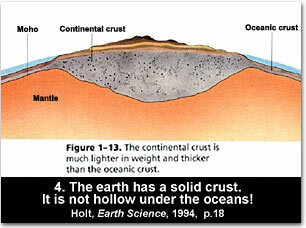 Psalm 33 (v. 7): “He gathereth the waters of the sea together as an heap: he layeth up the depth in storehouses.” What today is in the oceans on the surface used to be in the crust of the earth, stored up in big subterranean chambers. Psalm 136: “He stretched out the earth above the waters.” Better read that verse very carefully. It's giving us a powerful clue about what the original Creation was like. And then the “fountains of the deep broke open.” (Gen. 7:11) The water that used to be in the crust went shooting to the surface when the fountains of the deep broke open. The Bible says in Job 38 (v. 8): “Who shut up the sea with doors, when it brake forth, when it issued out of the womb?” I'll tell you what, if you have never seen a baby born when the water comes breaking out of the womb, it is an amazing process. One of my friends was in college; his wife was standing there cooking breakfast in the kitchen; and her water broke, phgooooh...; just like she wet her pants, all over the floor. Her husband came running in, “What happened, what happened?” and he slipped and broke his arm. And she had to drive him to the hospital to get his arm set. What a mess when babies are born. I delivered all my kids at home; and when the water issues out of the womb, it is a royal mess. And God, He is telling us here in the book of Job, God is talking here in chapter 38, that when that water issued out of the earth, it just burst out of the earth. It goes on and says: “And brake up for it my decreed place, and set bars and doors, And said, Hitherto shalt thou come, but no further: and here shall thy proud waves be stayed.” (Job 38:10-11) I believe the earth broke up at the time of the Flood and we still have the scars all over the planet where this happened. They are called fault lines. I lived right by the Saint Andreas fault. I've studied the Hayward fault, the New Madrid fault, the Golden fault. None of them are my fault, but I've studied them, ok. 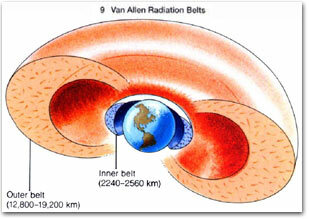 There's no question the earth is busted up into plates. And there is no question these plates are moving. 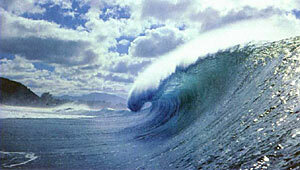 And when they move it can cause tsunamis and earthquakes and volcanoes. There's no question that stuff happens. The question is: “When did this happen to the earth?” I think it happened about 4,400 years ago at the very beginning of the Flood. And evolutionists will say: “Don't you see that's proof of Pangaea. These continents fit together. Can't you see how South America and Africa seem to be a fit?” Well ye hold on a minute. How many of you have heard of Pangaea? They teach it in the textbooks like it is some kind of fact, you know: “All the continents used to fit together.” I say: “Guys, now wait a minute. There's a couple things you ought to consider about this Pangaea theory, before you get too excited.” First of all, they'll say South America and Africa seem to fit. Yeah, my house and the neighbors house would fit too if you slid them together. What does that prove? Nothing. It doesn't prove the street oozed up in-between them and the houses slid apart, ok. It's a pure coincidence. The shape of these continents is an absolute pure coincidence based upon the water level. The evidence they use for continental drift is interesting. They'll say the shapes of the continents seem to fit. Similar fossils are found on opposite sides of the ocean. Well, that may be true. But it's also true those same fossils are found literally all over the world. Those fossils found all over the world is just as much evidence for a Flood. I mean, a worldwide Flood, how far could the dead animals float around? Uh, quite a way, right? And then they'll say there are magnetic reversals in the Mid-Atlantic ridge. They don't tell you they shrank Africa nearly 35 ot 40% to make them fit, do they? 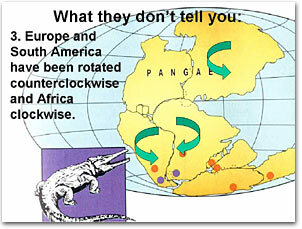 They don't tell you that Europe and South America were rotated counter-clockwise and Africa was rotated clockwise to make them fit. And they also don't tell you, what I think ought to be obvious to a kindergartener. Did you know, if you took the water out of the oceans, you would notice there is dirt underneath? I mean, the oceans actually have a bottom to them. How many knew that already?, ok. I mean, they do have a bottom, ok. So people say: “Do you think the continents were ever connected?” I say: “Well duh, they're still connected right now. What do you mean, were they connected? Helló...!, they are still connected. They've always been connected.” The earth has a crust. At the low places they're full of water; I understand, ok. 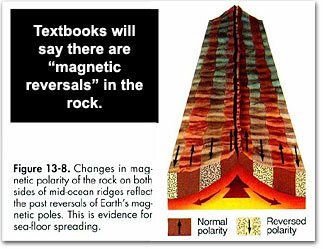 But textbooks say: “Well yes, but there's magnetic reversals at the bottom of this Mid-Atlantic ridge.” Well that's simply baloney. 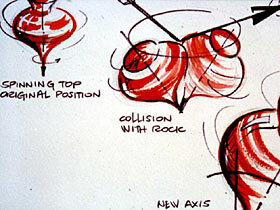 There are no reversed polarity areas unless it's where rocks flipped over when the fountains of the deep broke open. That may have happened in some areas. But this is a lie talking about magnetic reversals. 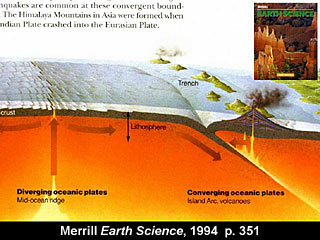 Even one author wrote in a book: “Deep Crustal Drilling in the North Atlantic Ocean”, Science magazine, volume 204. He said: “It's clear the simple model of uniformly magnetized crustal blocks of alternating polarity does not represent reality.” What they show you in your textbooks is not reality. 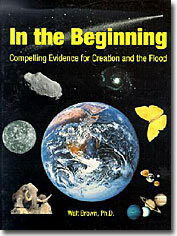 Now Walt Brown has a great book called, In the Beginning. I disagree with Walt Brown on a couple of key things, and he's a friend of mine. A brilliant man, PhD in physics, taught at the Air Force Academy for years. He has a website, www.creationscience.com. I highly recommend his book in spite of our minor disagreements. He's got some great stuff on here on magnetic reversals. 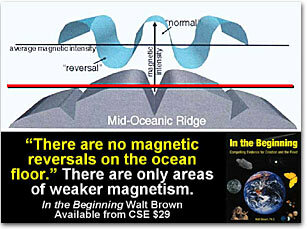 No, “there are no magnetic reversals; only stronger and weaker magnetism.” It's actually a jumbled up mess down there at the Mid-Atlantic ridge. 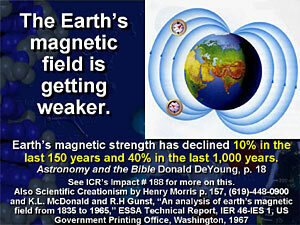 See, the earth has lost 10% of its magnetic strength in the last 150 years. It's lost 40% of its strength in the last 1,000 years. 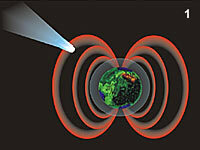 There is pretty overwhelming evidence that the earth's magnetic field is getting weaker. What does that mean? Well that means it used to be stronger. And if the earth's magnetic field is getting weaker, this creates a problem; because if you go back in time about 25,000 years, the magnetic strength would have been too great for life to exist here, because of the heat generated. And so the evolutionists have to find an answer for the problem: “Hey, we're watching the magnetic field decline, so it must be going through reversals.” It has never been observed to reverse, it has only been observed to decline. 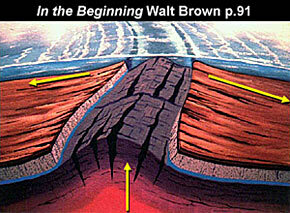 I think Walt Brown has the best theory on continental drift. Let me play this for you real quickly. This is what's called the Hydroplate theory by Dr. Brown. To me, it answers a lot of questions. “We can see on our planet 17 very strange features that can now be systematically explained as a result of a cataclysmic global flood, whose waters erupted from subterranean chambers with an energy release exceeding the explosion of 10 billion hydrogen bombs. This explanation shows us just how rapidly major mountains formed. Why the ocean floors have huge trenches with hundreds of canyons and volcanoes. Major land canyons, especially the Grand Canyon. The pre-Flood earth probably had one very large supercontinent containing lush vegetation, seas, rivers, and minor mountains. According to the Hydroplate theory, the pre-Flood earth had a lot of subterranean water. About half of what is now in our oceans. This water was in interconnected chambers forming a thin, spherical shell, about half a mile thick, perhaps 10 miles below the earth's surface. Increasing pressure in the subterranean water chamber, stretched the overlying crust. Just as a balloon stretches when the pressure inside increases. Failure in the crust began with a microscopic crack which grew in both directions, at about three miles per second! The crack, following the path of least resistance, encircled the globe in about two hours. 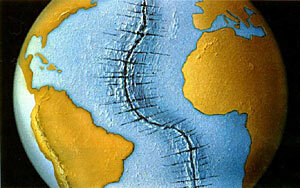 As the crack raced around the earth, the overlying crust opened up like a rip in a tightly stretched cloth. The subterranean water was under extreme pressure because of the weight of the 10 miles of rock pressing down on it. So the water exploded violently out of the rupture. Calculations show that all along this globe encircling crack, fountains of water jetted supersonically over 20 miles into the atmosphere. The spray from this enormous fountain produced torrential rains such as the earth has never experienced before or after. The Bible states that ‘all the fountains of the great deep burst open on one day.’ (Gen. 7:11 ) And it describes these events about 4,500 years ago. Which we can now tie together scientifically in cause and effect order as the Hydroplate theory. The fountains of the great deep and the expanding steam produced violent winds. Some of the water jetting high above the cold stratosphere froze into super cool ice crystals; produced some massive ice storms; burying, suffocation, and instantly freezing many animals. The high pressure fountains eroded the rock on both sides of the crack and even threw up the limy contents of many pre-Flood seas. Huge volumes of sediments settled out of this muddy water all over the earth. These sediments trapped and buried plants and animals forming the fossil record. The flooding uprooted vegetation moving it to regions where it accumulated and quickly became coal and oil by processes we can duplicate in the laboratory today. Experiments show that as erosion widened the rupture, its width became so great that the compressed rock beneath the subterranean chamber, sprung up, giving birth to the Mid-Oceanic ridge that wraps around the earth like the seam of a baseball. The continental plates, the hydroplates, still with lubricating water beneath them, slid downhill, away from the rising Mid-Atlantic ridge. After the massive, slowly accelerating continental plates reached speeds of about 45 miles an hour, they ran into resistances, compressed, crushed, thickened, and buckled. 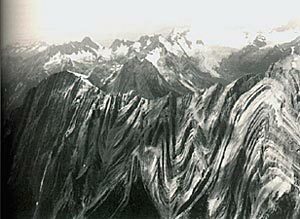 The portions of the hydroplates that buckled up formed mountains. Those that buckled down formed ocean trenches. This is why these features are generally parallel to the oceanic ridges from which they slid. There, that is Walt Brown's Hydroplate theory, which to me makes the most sense of anything I've seen. It explains several things. 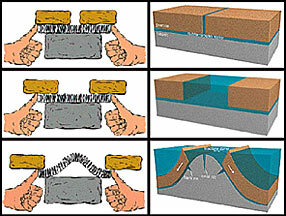 If the crack would widen around the Mid-Atlantic ridge as the waters shooting out, it's going to spread out allowing the basalt underneath to bulge up, which is precisely what happens. As the basalt bulges up, it's gonna get cracks in it and it's also gonna slide the super imposing plates away from them. They're gonna slide and run into something else, which would explain the compressed mountains we see. In for instance, in British Columbia where the mountains are smashed from the end. I mean, the wrinkles go up and down. The mountain was, it's like somebody pushed carpet up against the wall causing it to wrinkle. I think Christians need to have an answer for those kind of things and this is one of the possible answers. When the basalt cracked, the water would rush into the crack, cooling it down, and cool rock holds a magnetic field. 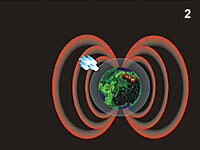 Hot rock will lose a magnetic field. 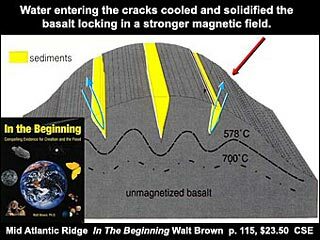 So, when they found, what they said were magnetic reversals at the bottom of the ocean floor, they were actually finding the old cracks where the basalt broke; because there were going to be warmer and cooler areas from simply the water rushing in. Those cracks are probably now all full of sediments. So don't let them tell you there are magnetic reversals. There may be a few from the rocks flipping over at the flood, but I think a much better theory is the Hydroplate theory. So, as the continents were sliding away, some places are gonna be sucked under, plate subduction. Now Bob Gardener has a great theory on plate subduction. I think this ties in here also, that the plates would tend to be sucked down. Have you ever stirred a pudding up and it gets a film on top? If you push in on the film in the pudding, it'll sink to the bottom and drag the rest of it with it. Magma does the same thing from a volcano. When it cools down, the lava gets a hard crust, and then if it sinks in at one place it will drag a whole sheet of magma of lava with it. This probably happened also during the Flood. See, the continents are eroding. When it rains, you have landslides, mudslides, erosion, mass wasting, ground creep. All of those things are happening continually, like last night in the thunder storm here. I'm sure a lot of erosion took place around Chattanooga. Well, this mud is gonna wash into the ocean. So two things are happening, the mountains are getting shorter, the oceans are filling in. 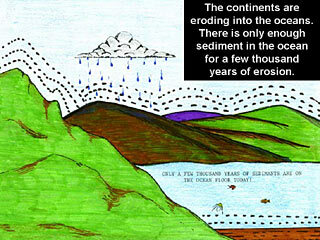 But at the current rate of erosion, the continents are going to erode flat in 14 million years. So the evolutionists have a serious problem. Why aren't the oceans full of mud? Because there's only a few thousand years worth of mud in the oceans. And why haven't the mountains eroded away yet? That doesn't prove they've always been moving. And it doesn't prove the rate has always been the same as we see today. I think students should be told there are other options than what they're being taught in school. Now I live right by Interstate 10 in Pensacola, Florida. Interstate 10 runs all the way from Los Angeles to Jacksonville, Florida. If I see somebody headed east on Interstate 10 at 70 miles (110 km) an hour, does that prove they started in Los Angeles four days ago? Uh, no, they may have just got on at the last exit, right? And just because we see these continents moving a little bit today does not prove anything, long-term historically. Don't fall for that propaganda. 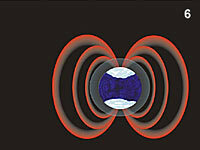 The magnetic field is getting weaker. There is very little sediment in the ocean. And another explanation for that might be that the Bible is right and the earth is not billions of years old. What froze the mammoths in upright position? Trees in Alaska that were 300 feet high? People say: “Well where does the ice age fit into the Bible?” There certainty was an ice age. There's not much question; ice came all the way down to Kansas City, Missouri. How many of you are from Ohio, or Indiana, or Michigan, or Minnesota, or one of these states that were covered by ice? They used to be covered with ice, ok. Actually, this time of year they are still covered by ice. 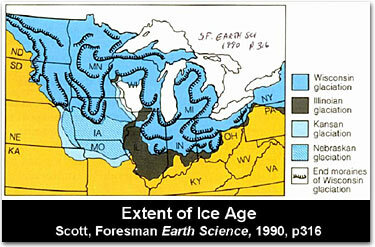 There is all kind of evidence around those states that you can prove there really was an ice age. When ice pushes out, it piles up a pile of rocks in front of it. When the rocks are left there, when the ice melts back, it's called a terminal moraine. If it pushes the rocks to the side, it's called a lateral moraine. When the ice melts back, it leaves behind lakes called kettle lakes. Minnesota, the land of 10,000 lakes, is full of kettle lakes. As the ice melts back, the ground actually lifts back up, because the weight is gone. The ground may lift up quite a ways. That's called isostatic rebound. There is no question those things actually happened. The question for the Christian is: “Where does this fit into the Bible? And what froze the mammoths?” Some of the big, hairy, hippy elephants that are found frozen standing up, food still in their teeth. What happened to the mammoths? One year it was reported that 20,000 mammoth tusks were extracted from the ground. Just one year, 20,000 tusks. Estimates are that five millions mammoths perished in one catastrophe. These red dots indicate where frozen mammoths have been found. 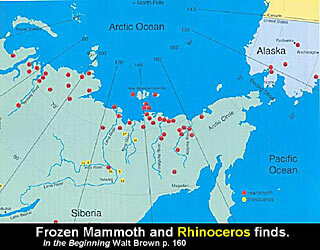 The yellow dots indicate where frozen rhinoceros have been found. What happened to the mammoths? Well some of the mammoths are frozen in the upright position. The undigested food in their stomach and mouth is an interesting situation. They died of suffocation. There is no water found in the lungs. The small ice crystals in the blood indicate they probably froze in less than five hours. That requires something less than 300° below zero. Now it never gets 300° below zero on earth. The coldest temperature ever recorded, from National Pornographic, ...Geographic, is minus 127°. That's pretty chilly, but that's not cold enough to freeze the mammoths. What happened to freeze the mammoths? Well, I preached Barrow, Alaska a couple years ago. There is only one tree in Barrow, Alaska, and it is about this tall in a Chinese restaurant. They struggle to keep it alive because they don't get much sun up there for months at a time. There are no trees outside in Barrow, Alaska. There are certainly no trees 300 feet tall. There are very few trees in the world that are 300 feet tall. How do you get a tree 300 feet tall standing up under 1,000 feet of permanently frozen ground? What happened? I'm gonna give you what I call the Hovind Theory of what caused all these phenomenon. But I need to review a little science for you. Many people have been influential in developing this, in my brain anyway. I appreciate Walt Brown, and Henry Morris, and Baumgardner, and some of these guys that have done work, and The Biblical Flood and the Ice Epoch, had a great influence on me. But ultimately I have to take the blame for this if it's wrong. I'm gonna teach you a few things about science and then give you the Hovind Theory. 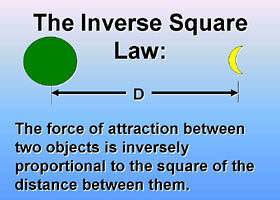 The inverse-square law tells us that if two objects are attracted to each other; like the earth and the moon; the force of attraction is inversely proportional to the square of the distance between them. In English, that means if you half the distance, or if you brought the moon in to ⅓ the distance, you take the ⅓, flip it over, and square it. It's now 9 times the gravitational pull. Inverse-square laws apply when you're dealing with forces involving gravity, light, magnetism, and girls. I travel every single week. I believe I've been home eight Sundays in fourteen years. I flew 215 times last year, was gone 210 days away from home. So I get to come home every week. When I get a certain distance from my wife it's, “Hello dear, how are you doing?” When you half the distance it is four times the attraction, not two. When you half the distance again, it is too late. So guys, the secret is stay about 10 feet (3 m) away and you won't have a problem, ok? 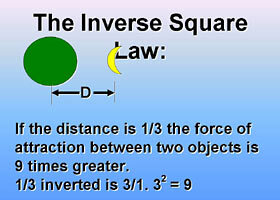 Now, the inverse-square law is one thing to learn. The second thing you need to learn is a spinning top, or any spinning object, behaves in a peculiar way if it is struck by something. 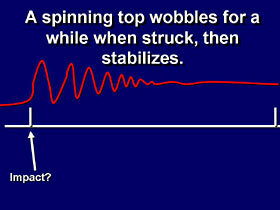 If you throw a rock at a spinning top, it will wobble around for a while. Or you can do it with a gyroscope, and it will wobble around and it will recover, spinning smoothly, usually at some new crazy angle. You can actually determine when it was struck, if you can see a graph of a wavy line of how it behaved as it was wobbling, interesting. The earth has no doubt wobbled through the years. The North Pole has moved around. 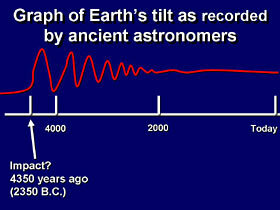 Today the earth is tilted over 23.5°. That is why they always mount the globe on that 23.5° angle. Stonehenge is an interesting stone building. Apparently it was built to worship the sun at summer solstice. 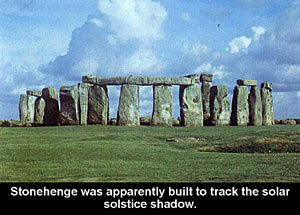 But today, Stonehenge does not line up. The Temple Amen Ra was apparently built to worship the sun at summer solstice, the longest day of the year. But it doesn't line up. Eudoxus, same thing. 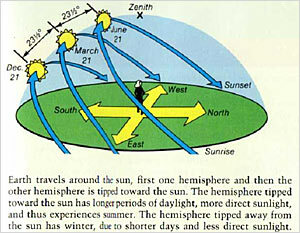 The earth is tilted over today, and that's what causes the seasons. It is usually on June 21st, occasionally on June 20th, but usually June 21st, it is the longest day of the year because the earth is tilted. In our case with the Northern Hemisphere we're tilted toward the sun, so we get more sunlight. At the North Pole it gets pure sunlight all the time, 24 hours. George Dodwell, the famous Australian astronomer did a lot of study of the solstice shadows recorded by ancient astronomers. He said: “You know, it looks to me like something struck the earth.” When he followed the wavy line made of these solstice shadows, he said: “Something struck the earth about 4,350 years ago and caused the earth to wobble for several thousand years. Today the earth is pretty stable. The North Pole doesn't move around very much. But could it be that something actually struck planet earth about the time of Noah's Flood? Well, that's what the scientific evidence points towards, interesting. 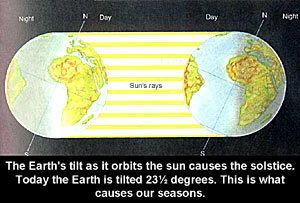 Today the earth is tilted over and that's what causes the seasons. 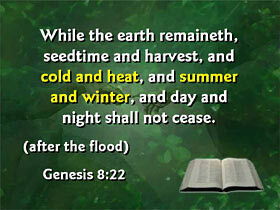 The first mention of cold weather in the Bible is in Genesis, chapter 8 (v. 22), after the Flood. I doubt they had huge, polar ice caps before the Flood came. I flew up as far north as we could in Canada and then drove two hours north of that, way up into central Saskatchewan. We were only right about here. There's a whole lot of earth above us, but they said this is about the limit of habitable land where you can actually do farming, because north of here the seasons are too harsh, you can't do any farming. There is a huge chunk of planet earth, North and South, right near the poles that is simply unusable for farmland. Now the Bible says, that God formed the world to be inhabited. I don't think what we have today is anything similar to what Adam and Eve saw. Well, duh! Why can they see a canyon on Mars were we can't find any water for sure and say this thing formed quickly and you can look at Grand Canyon on planet earth and can't conclude that water formed that canyon very quickly? I don't understand the stupidity involved here. Looks to me like that a person ought to be able to see that. As “a ridge at the edge of the crater gave way,” this Mars canyon formed in “a matter of months, certainly less than a year,” said one of the scientists. Next thing to keep in mind. It's called the Meissner effect. How many of you have ever seen two magnets; you put them together and one will float on top of the other one? You know what I'm talking about here? It's called the Meissner effect. That's how the Japanese trains go. We rode on one of those trains when I was in Japan. 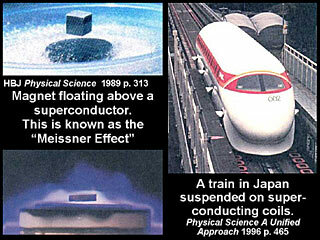 Man, they go flying down the tracks with magnetic levitation. No resistance that way; no friction. Next thing to keep in mind. 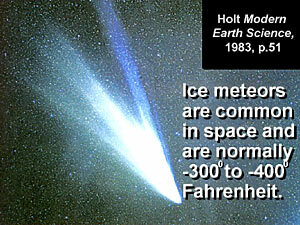 There are comets flying around through space and these comets are extremely cold. 300° to 400° below zero Fahrenheit. Don't lick it. I need to find out if any of you are or were as dumb as I was as a kid. How many of you have a piece of your tongue stuck to a pump handle or flag pole someplace on planet earth right now because of you licked it when it was cold. Come on now, be honest. Ok, there is several. Don't lick something that's 300° below zero. Trust me on that one. That will be the last thing you lick for a while. If you throw a snowball too fast it will break apart. You couldn't possibly shoot a snowball out of a cannon. If you did, it would simply break apart in pieces before it even got out of the end of the barrel. So, a super cold ice meteor, if it were coming toward the earth, would build up speed because of the inverse-square law. As it got going faster and faster it would break up out in space into a bazillion of little crystals. Those would then shower down on the earth as super cold snow. Next thing you need to keep in mind. 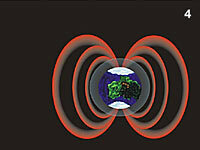 The earth has a very strong magnetic field, but it's getting weaker. At the time of the Flood, it was probably about 15 to 20 times stronger than it is today. 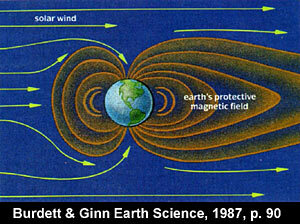 The magnetic field is weakening. 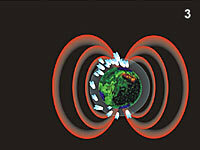 The magnetic field would deflect super cold ice crystals to the poles, most of them. Also, super cold ice is easily statically charged. The Northern Lights are caused because of the earths’ magnetic field. How many have ever seen the Northern Lights? Unbelievably gorgeous. If you've never seen them it's worth, just get up there. I've seen them in South Dakota and up in Canada. Unbelievably beautiful, the Northern Lights are something worth seeing. Anyway, the pre-Flood world was very different. The world probably had a canopy of ice or water above the atmosphere. We cover that on video 2. Now, there are some creationists, including Walt Brown, who disagree. They say there was no canopy. And I think the arguments they use can be easily answered. And I'd be glad to discuss that if you'd like more. Next thing to keep in mind. 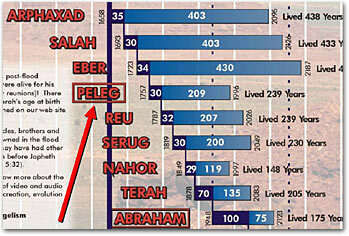 Who on earth was Peleg? Genesis chapter 10. And I hate to say this about the Bible, so God don't listen for just a minute, ok? But Genesis 10 is boring, ok. As you read through that chapter it has all these big names that nobody on earth can pronounce except Alexander Scourby, you know. “So and so begat so and so, and he begat so and so, and he begat so and so.” And you're reading through this long, boring chapter of everybody begatting everybody. And all of a sudden you come across verse 25. And it says: “Unto Eber were born two sons: the name of the one was Peleg; for in his days was the earth divided; and his brother's name was Joktan.” Well now hold on a minute. Peleg is the only guy; it doesn't say anything about anybody else; why does it say something about Peleg? It says: “In his days was the earth divided.” And then it says: “His brother's name was Joktan.” Nobody else gets their brother mentioned. Why would his brother be mentioned. Well the word Joktan means, shorten. Peleg means, divided. Peleg was born about 100 years after the flood. Notice he only lived to be 239. His daddy, and grandpa, and great grandpa lived in their 400's. What was different? What happened in the days of Peleg? Next thing you need to keep in mind. 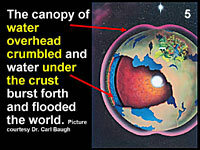 The pre-Flood world had a canopy of water above and water under the crust of the earth, ok. I'm gonna give you the Hovind Theory. This is supposed to be a good teaching technique. I'm gonna tell you what I'm gonna tell you, and then I'm gonna tell you, and then I'm gonna tell you what I told you. You get all that? We're gonna go through it very quickly. Eight simple steps of what I think caused the Flood and explain all these strange phenomena on the planet. Then we'll go into a little bit more detail and then we'll close this down. 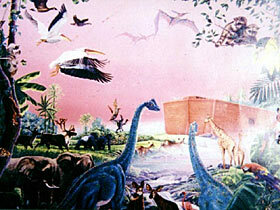 Noah and the animals got safely into the ark. A 300° below zero ice meteor came flying toward the earth and broke up in space. 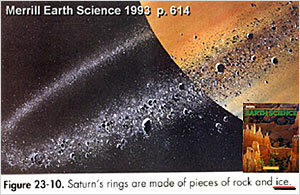 As it was breaking up, some of the fragments got caught and became the rings around the planets. They made the craters on the moon, the craters on some of the planets, and what was left over came down and splattered on top of the North and South Pole. This super cold snow fell on the poles mostly, burying the mammoths, standing up. The dump of ice on the North and South Pole cracked the crust of the earth releasing the fountains of the deep. The spreading ice caused the ice age effects; the glacier effects that we see; it buried the mammoths; made the earth wobble around for a few thousand years. And it made the canopy collapse, that used to protect the earth. And opened up the fountains of the deep. During the first few months of the Flood, the dead animals would settle out, and dead plants, and get buried. They would become coal, if they're plants, and oil if they're animals. And those are still found today in huge graveyards; fossils found in graveyards; oil found in big pockets under the ground. During the last few months of the Flood, the unstable plates of the earth would shift around; some places lifted up, other places sank down. That's gonna form ocean basins and mountain ranges. And the run-off would cause incredible erosion like Grand Canyon in a couple of weeks. Over the next few hundred years, the ice caps would slowly melt back retreating to their current size. 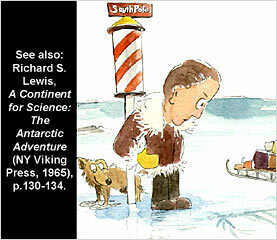 The added water from the ice melt would raise the ocean level creating what's called a continental shelf. It would also absorb carbon dioxide out of the atmosphere which allows more radiation to get in which is gonna shorten people's life spans. And in the days of Peleg, it finally took affect. The earth still today shows the effects of this devastating flood. Now, little more detail on each one. God told Noah, the Lord said to Noah: “Come thou.” Did you catch that? Listen very carefully. What did God tell Noah to do? He told him to come into the ark. He didn't say go into the ark. He said come into the ark. Where does God have to be in order to say that? In the ark. That will preach, brother. There's a sermon right there, just right there. “Come into the ark Noah. Come with me, we're going on a little cruise. Come on in, I'm here with ya.” And when the flood was over, God said: “Noah, go out of the ark.” (Gen. 8:15) God was with him the whole time. That would be quite the cruise. “And the Lord shut the door.” (Gen. 7:16) By the way, it is a good eternal security verse. If the Lord's got you saved, you're saved, ok? You can't get out of God's hand. Then this 300° below zero ice meteor came flying through the solar system. Some of it broke apart. It made craters on Mercury, craters on the moon. Four of the planets today still have rings around them. And the rings around these planets are made of rock and ice. Very interesting. Now, Walt Brown thinks some of the craters on the moon were formed when the fountains of the deep broke open and rocks went flying up out of earth's gravitational pull, drifted around for a while, and clobbered into the moon. He may be right on that, I don't know, but it's interesting. He thinks the comets came from earth, and water on Mars came from earth, when the fountains of the deep broke upon. You could read about it for yourself if you'd like. Were mammoths designed for cold weather? What happened to them? The super cold snow would land mostly around the poles, because super cold ice is not only affected by the magnetic field, it is easily statically charged. How many have seen an electrical Van de Graaff generator that make your hair stand up. We have one of those in our science center at Dinosaur Adventure Land. As this ice meteor came flying towards the earth, it broke apart. Pieces would settle in around the poles mostly, causing the earth to wobble for a few hundred years, or maybe even a few thousand years. The canopy of water overhead collapsed, then it rained 40 days. 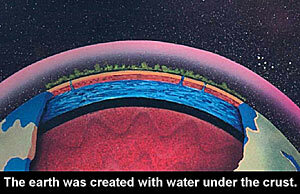 The water underneath the bottom, under the crust came shooting to the surface, and the water kept going up for 150 days. And everybody drowned. It probably took six or eight months to kill everybody during that flood. We all get the idea, “Well, it rained and everybody died first day.” No, it took a long time for people to die. People would be running and fighting for higher ground. As that got more and more rare as the water keeps coming up, and up, and up, for 150 days, the water increased. By the way, they are still discovering chunks of ice flying around in space. Here's an article about a scientist who discovered chunks of ice as big as this auditorium, are hitting the earth all the time. They dissolve in space and it rains down as water. 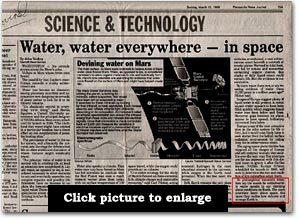 There's “Water, water everywhere – in space,” Science & Technology article here. There is an island up there called the New Siberian Islands, off the coast of Russia. 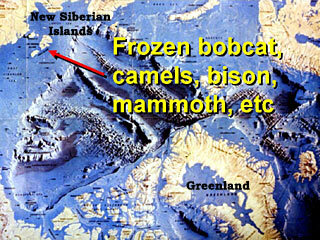 They are those New Siberian Islands; they find frozen bobcats, frozen lynx, frozen camels. What happened? When they drilled down through the ice at the South Pole, they find coal under the ice at the South Pole. I would like to point out, your honor; there are no trees in Antarctica, zero. Admiral Byrd went down there and said he saw frozen palm trees, or palm leaves, near the South Pole. Scientists have discovered all sorts of frozen leaves, even dinosaur fossils, plant eating dinosaurs, near the South Pole. “Thousands of well-preserved leaves” found in Antarctica? “Leaves on the side of a cliff, 250 miles from the South Pole”? And “the leaves still retain their original, cellular structure and organic content.” They're not petrified. They're preserved. They find dinosaurs, plant eating dinosaurs, in northern Alaska. But today there are no trees up there. I was there. Nothing, not a blade of grass in most places. See, the earth actually has two North Poles. We have a geographic North Pole where we spin around. We also have a magnetic North Pole in Canada where the compass actually points. Now here in Tennessee it probably doesn't make a lick of difference. Your compass points north because both of them pretty much line up. But if you live in Alaska, your magnetic north is way different than the real north. And pilots have to learn to adjust for that. And who cares? Right? Ok. I think what happened, the mammoths were up there chopping on their tropical flowers. It was a beautiful day, and it began to snow super cold snow. They had never seen snow before. 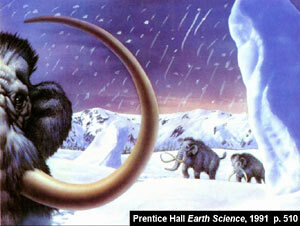 One of the mammoths looked at his buddy and said: “Herman, this is peculiar weather we're having here. What is this white stuff falling out of the sky?” He said: “I don't know, but let's get out of here.” They started running around trying to find a place to hide and the snow got deeper and deeper and deeper and they got stuck in the snow standing up, and they couldn't even fall down. How many of you have ever been in a snow drift so deep you couldn't even fall over? have you ever been in one of those? I think that's what happened to the mammoths. People say: “Well the mammoths have long hair. They're designed for cold weather.” No, mammoths are not designed for cold weather. A lot of animals in the jungle have long hair, where it's hot, ok. If the temperature is 70°, long hair is just simply a decoration. There's a lot of things about the mammoth that shows they were not designed for cold weather. There's a whole section just in this book about mammoths are not designed for cold weather. You can read all about that. So, the mammoths, some of them ended up frozen, standing up in super cold ice, 300° below zero. 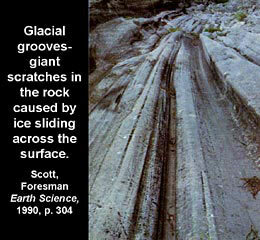 As the ice goes pushing out towards the equator, it's gonna carve out glacial grooves. If you live in Ohio, if you walk to Kelly's Island, you can go out there in Lake Erie, and see the glacial grooves, scratches across the rock for miles. I think the ice age really happened. But it happened at the beginning of the Flood. There are basically two theories among creationists about the ice age. 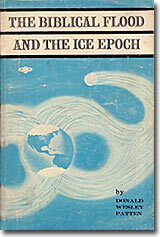 One theory says the ice age caused the Flood, which is what I believe. The other theory says the Flood caused the ice age. A minor difference; I don't think it's worth fighting over. Either case though, I think the ice age would last several hundred years after the Flood. During the time after the Flood; as populations were growing; if somebody misbehaves, instead of building a jail and putting them in there where you got to feed them for the rest of their life, just banish them. Say: “Get out of here, you can't stay with our civilization.” And boy, if times were hard, and just a new struggling civilization like Gilligan's Island, being banished is punishment enough.